Nelson Mandela at Independence Hall, Philadelphia, PA, 1993. As the world mourns the passing of Nelson Mandela, I am reminded of a visit to Zimbabwe some years ago where I had the privilege of hearing him speak. Robert Mugabe was also on the platform that day and I remember being struck by the great difference in the receptions afforded the two men. While Mugabe was greeted with polite (faint) applause, the room filled with ululations and other expressions of appreciation and admiration as Mandela stepped to the podium. 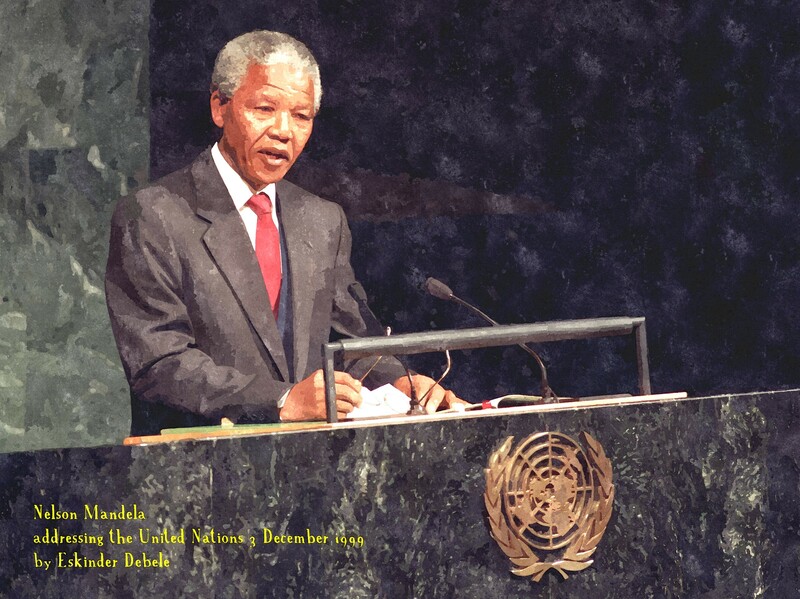 Mandela, on that day, praised the missionaries who had been so influential in his walk with Christ and he insisted he would not have been the man he was if not for his faith. I pray that followers of Christ who are reading this today might honor Mandela (and, more importantly, the God he served), by celebrating what Christ has done for us and by working each day for justice, peace and righteousness wherever the Lord calls us. And for anyone reading this today who has not met Jesus, I pray you might take note of how a walk with Christ may transform your life as it did Mandela’s. I pray you might invite Jesus into your life, celebrate your first true Christmas with great joy, and know the all-surpassing peace of the Lord all your days. One Mandela statement that I’ve seen quoted again and again yesterday and this morning is this: “As I walked out the door toward the gate that would lead to my freedom, I knew if I didn’t leave my bitterness and hatred behind, I’d still be in prison.” Would that we might all be granted the power by the Lord to overcome the bitterness, hatred and unforgiveness in our lives! Freedom.